Ability to define your pricing in more local currencies is essential to your business development: according to Kris Green, the Chief Strategy Officer of Borderfree, U.S. retailers are seeing 20-30% of their website traffic coming from non-U.S. IP addresses. If you are in Canada, Australia, New Zealand, South Africa, Nigeria, Kenya, Ghana, Denmark, or Norway, you can now sell more efficiently on your domestic market, with rounded pricing and transactions happening in CAD, AUD, NZD, ZAR, DKK, XOF, ZAR, NGN, GHS, KES and NOK respectively. 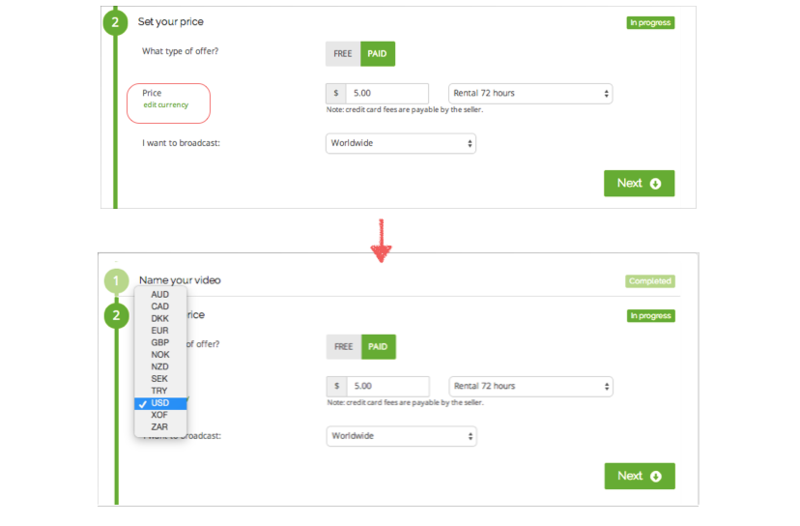 If – for example – you are based in the US and you’re selling worldwide, your customers (in more countries) can buy your videos in their local currency. This increases conversion rates and reduces refunds. Although global expansion presents obvious gains, it also brings many challenges, and often ecommerce platform don’t truly deliver a localized experience. This is especially true for online payments. Your customers expect (and appreciate) the comfort of a simplified checkout process, that allows them to purchase in their own currency – currency their prefer and trust the most. When it comes to local transactions management, Cleeng tries to deliver a headache-free, localized solution that respects different fiscal regulations. How to choose a local currency when creating a live pay-per-view event or a video on-demand? 1. When setting up an account with us, you are able to choose your default currency – in this currency you sell and also receive the payout. (Please note ZAR, XOF, NGN, KES, and GHS are not available at this point as your account default currencies). 2. If you wish to offer a particular video or event in any other currency than your default one, you can do it while creating an offer from your Cleeng Publisher Dashboard. 1. More effective targeting per market: thanks to a flexible choice between different currencies, you can sell to more markets and better meet local demands. 2. Higher conversion: thanks to a rounded pricing in local currency, not re-calculated value from another currency your promotional campaigns will become more effective. 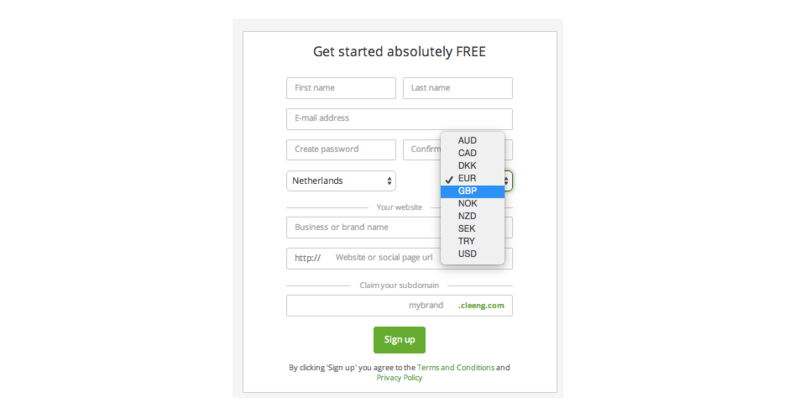 Since your offer looks like it’s intended for the customers in a particular country, you can expect those who used to just browse your offers, will actually buy them. 3. Retention through transparent pricing: if you offer your videos in a local currency, customers pay exactly what they see. 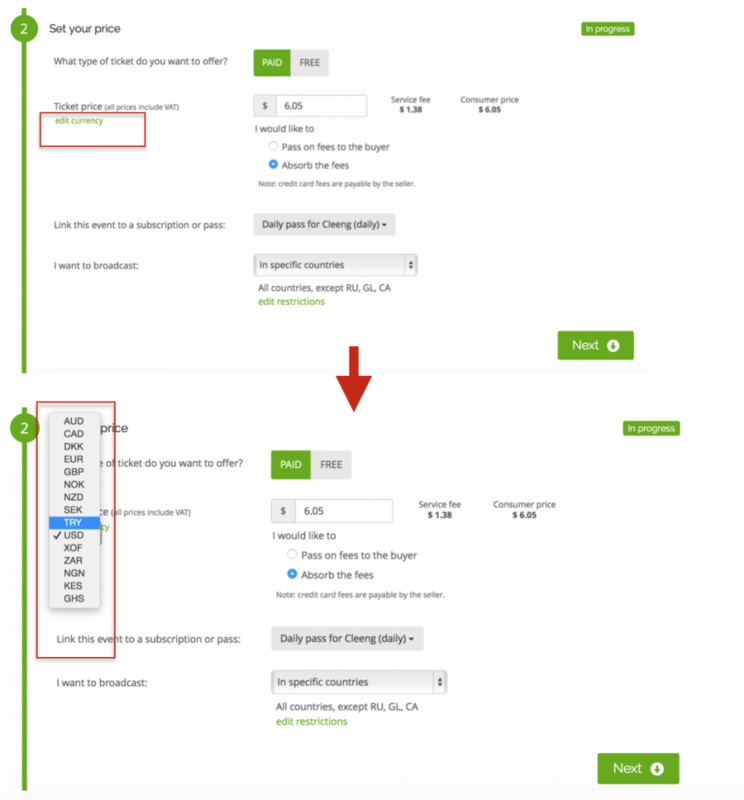 Lets say if you’re in NZD you can set price as 99 NZD users will be charged 99 NZF. Further, you collect 99 NZD minus fees.